Dunedin engraver James Brown produced New Zealand's first political cartoons, featuring caricatures of the 'old identities', prominent figures in the Otago settlement of the 1840s and 1850s. 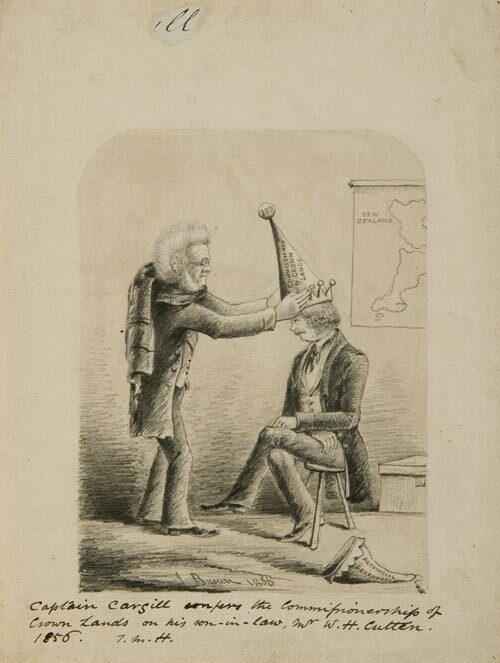 This cartoon comments on Provincial Superintendant William Cargill (left) appointing William Henry Cutten (right) as commissioner of Crown lands in 1856. Cutten, who was already provincial secretary, was also Cargill's son-in-law. The cartoon was published in James Barr's 1879 book The old identities.